This simple and delicious Italian-inspired dish barely qualifies as a recipe, which is one of the reasons I love it so much. Ready in less than 30 minutes, this pesto pasta with tomatoes is so quick, it comes together in the time that it takes to cook the pasta. With just 4 ingredients, it’s the kind of simple, easy, healthy recipe I find myself turning to more and more often these days. One of the things I love most about Weight Watchers is that you don’t have to give up anything, including pasta, one of my all-time favorite foods. Italians have been eating pasta every day for hundreds, if not thousands of years. Did you know that it’s estimated that Italians eat over sixty pounds of pasta per person, per year, three times more than they typical American? And they’re some of the healthiest, longest living people on the planet! I think the key is learning to eat fresh, healthy, delicious food in moderation, which is what Weight Watchers is all about. One of the keys to making this dish effortless is good jarred pesto sauce. I love the one you can get at Costco in the refrigerator section. It’s pricey but packed with flavor so a little goes a long way. Easier to find and more affordable is the Classico brand pesto for a few dollars a jar at most grocery stores. Serve with a big fresh tossed green salad for a restaurant worthy meal. According to my calculations, each serving has 286 calories, *7 Weight Watchers PointsPlus and *9 Weight Watchers SmartPoints. vegetarian – substitute white beans or chick peas for the chicken. Top with a bit of fresh mozzarella or goat cheese. low carb – substitute zucchini noodles or ribbons for the pasta. You can just stir them in with the pesto and tomatoes for a quick and easy one skillet meal. different – this is the kind of recipe you can change up in all kinds of ways. Use shrimp or scallops instead of chicken, skip the chicken and and top with fresh mozzarella or goat cheese. Toss in a can of drained artichoke hearts. Use a different kind of pesto – sun dried tomato, cilantro, etc. 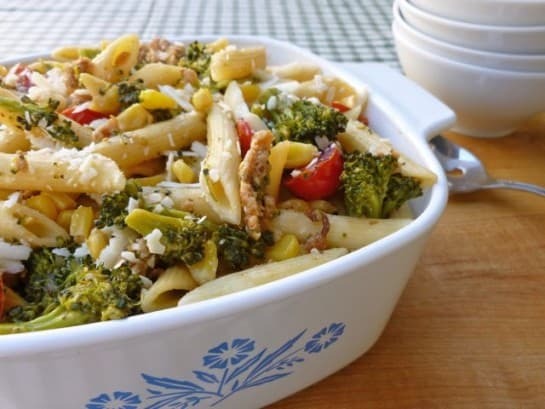 weight watchers friendlier – cut the pasta down to 6 ounces and increase the chicken to 2 cups turning this into a heartier pasta dish with just 8 SmartPoints. 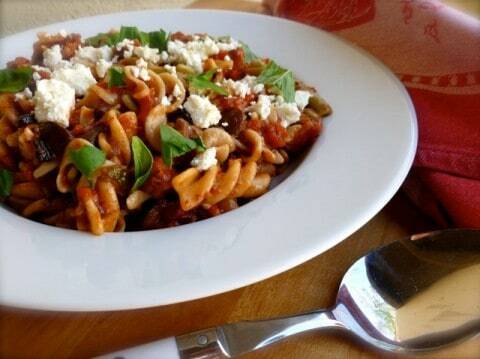 Use whole grain pasta. 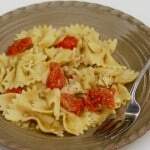 If you like this lightened up 4-ingredient pasta with chicken, pesto and tomatoes, be sure to check out my other easy, healthy Weight Watchers friendly recipes including Creamy Bacon Ranch Chicken Pasta, Copycat Olive Green Pasta Fagioli Made Lighter, Crock Pot Cajun Pasta Sauce with Sausage, Pasta with Smoked Salmon & Peas and Baked Pasta with Zucchini. Simple and delicious, this Weight Watchers friendly healthy 4-ingredient pasta with pesto and tomatoes can be made in the time it takes to cook pasta! Cook the pasta in a large pot of salted boiling water according to package directions until al dente. 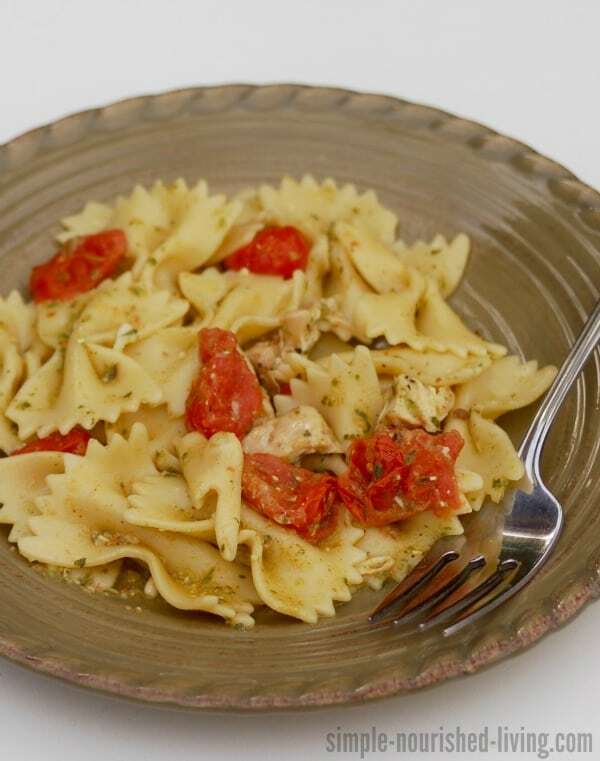 While the pasta is cooking, cook the cherry tomatoes, pesto and chicken in a skillet over medium heat for 4 or 5 minutes, stirring often, until the tomatoes begin to soften. With a large mug, scoop out 1/2 cup or so of pasta water before draining the pasta and set the water aside. Drain the pasta and place it back in the pot. Scrape the tomatoes and pesto mixture into the pasta and toss to coat. Add pasta water a little at a time if you feel the sauce needs to be thinned a bit.